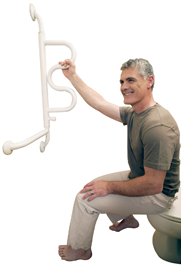 Curve Grab Bar is a space saving support rail. • Have a clear assessment made-Many caregivers and concerned family members rush to judgment when they see the senior in their life struggling with daily tasks. They may assume there is a mental deficit or that the senior cannot live alone. This is not always the case. Many times having a clear assessment made of the needs of the senior can show that by improving the way they are able to get around, the quality of life can be improved as well. What this means is by using a few simple methods the senior can more easily move around and accomplish what he or she would like to do in a day. Determine if their needs require major changes or small adjustments. • Focus on fall prevention-One of the biggest problems for seniors is falls. Alarming statistics show falls are the number one type of accident for seniors. In addition, those seniors who have to be hospitalized for a fall often require a longer and more costly hospital stay as well as decreased chance for full recovery. Caregivers need to carefully look through the home and make sure any fall hazards are eliminated. This can be done by installing bars in the bathroom and other high risk fall areas. In addition, rugs should be tacked down or even completely removed. The lighting in the home of the senior needs to be sufficient for the occupants needs both day and night. There are many lights which are motion sensor activated. This can make it much safer for the senior to get up at night. • Use the right mobility products-It is important to understand there are many different products which can be used inside the home that can easily and effectively improve the ability of the senior to move around their home. These products go far beyond the use of walkers and canes. Stander products are a great place to start. One of the best products they offer is a security pole and curved grab bar. The pole is tension mounted between the floor and the ceiling so there is no movement or slippage. This allows the senior to confidently stand up and grab hold of the curved grab bar to steady themselves before walking. The security pole can support the senior’s weight while the movable curved grab bar helps the senior be able to get a good grip before standing up. This affordable product can be placed next to furniture, bed, or even in the bathroom so the senior can safely exit the bath or shower. In addition, they also offer bed rails, car pulleys, and even lifts which can make getting in and out of a bed or a car much safer. • Addressing mobility can lead to great quality of life and the ability to age in place for seniors.